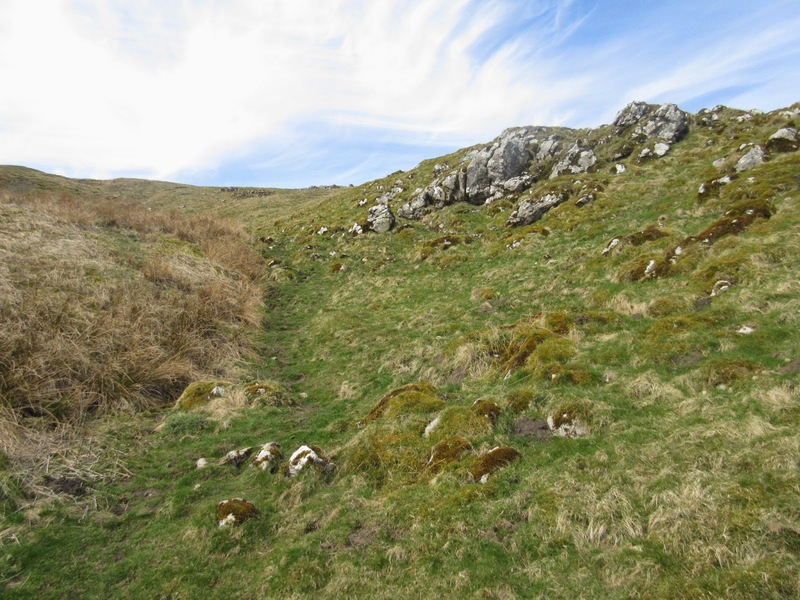 The Mid Craven was the first of the major Craven Faults to move, and therefore it is best to view it as a separate fault in its own right rather than a branch of the South Craven, as it is often described. This great fault appears to branch away from its more extensive neighbour at Settle, crossing the Ribble at Kings Mill and then running eastwards behind the reef limestone of High Hill. 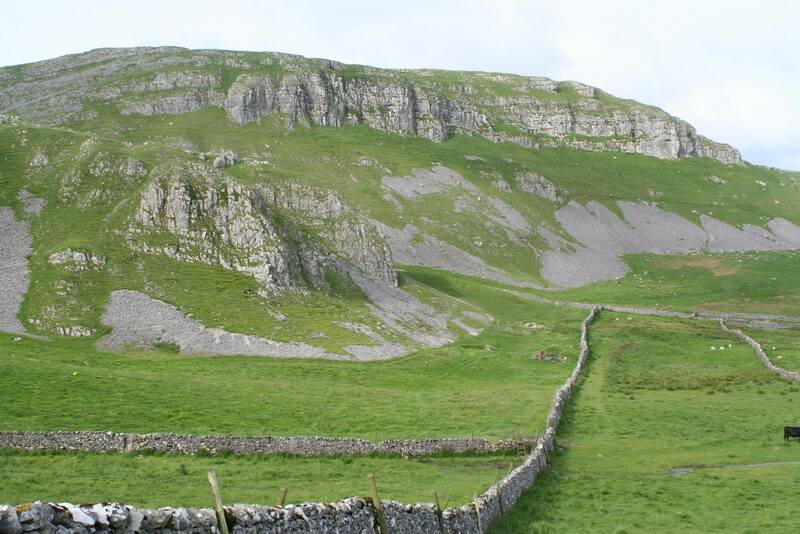 It then forms the impressive scars of Warrendale Knots and Attermire, before travelling over to Malham, where world famous limestone features are a direct result of its presence. In terms of creativity, the Mid Craven actually tops the lot. 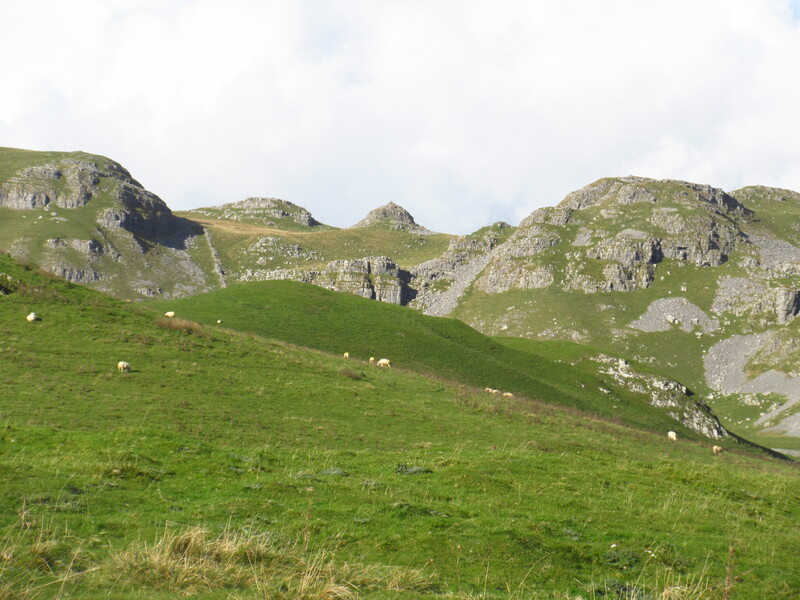 In Settle itself, the great crag of Castleberg stands just south of the fault line so that there is the unusual sight of Great Scar Limestone on either side of a main fault fracture. This oddity is explained by the fact that erosion and glaciation have lowered the great downfaulted slice of rock more or less to valley bottom level along the Ribble’s course. The upper layers have therefore been removed, so that the Great Scar, 170 metres (510 feet) lower than its uplifted equivalent to the north, is once again prominent as Settle’s most famous feature. It has also been trimmed off by moving ice as a passable truncated spur. The difference in height of the two bands of Great Scar Limestone on either side of the fault can be well seen from the A65 Settle by-pass. The Mid Craven Fault moved before the main Yoredale beds had a chance to be fully laid down. This means that the complex land ‘between the faults’, north of the Malham Road from Settle, sees the downfaulted Hawes (Yoredale) and reef limestones dominating the scenery, with the older Great Scar buried far below. 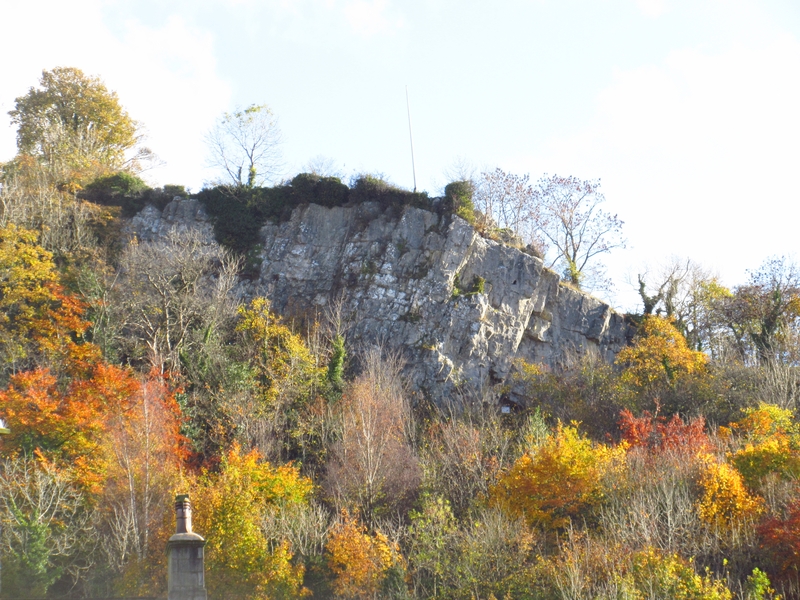 The uplifting of the developing Yoredale layers on top of the great limestone scarps along the fault line left them exposed to erosion. These layers were eventually removed, before late Carboniferous deltas smothered the whole area with Bowland Shales, sandstones and grits, completely hiding what is now Warrendale Knots and Attermire Scar. 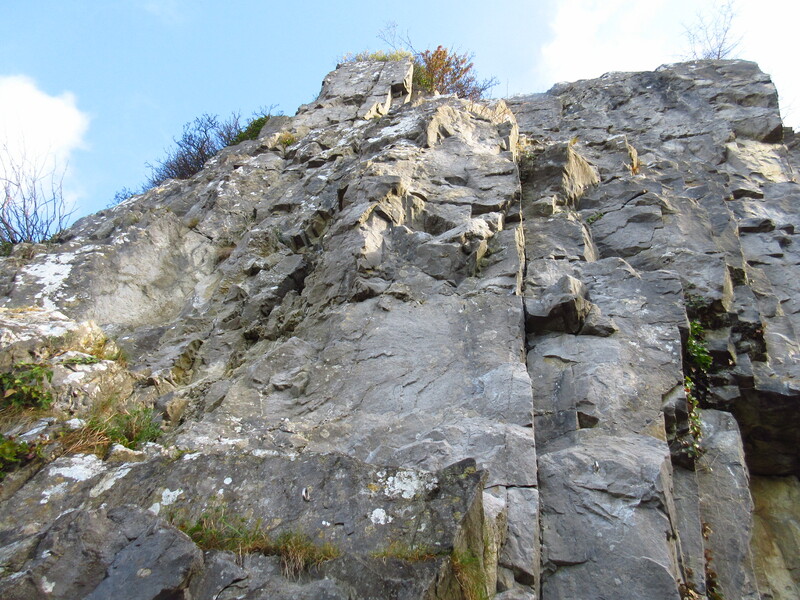 Only comparatively recently has erosion and glaciation once again removed this upper cover – leaving the awe-inspiring crags of Great Scar Limestone, with their towers, turrets and screes. In places, Bowland Shales still overlap the line of the fault, proving that they are indeed a post-fault feature. 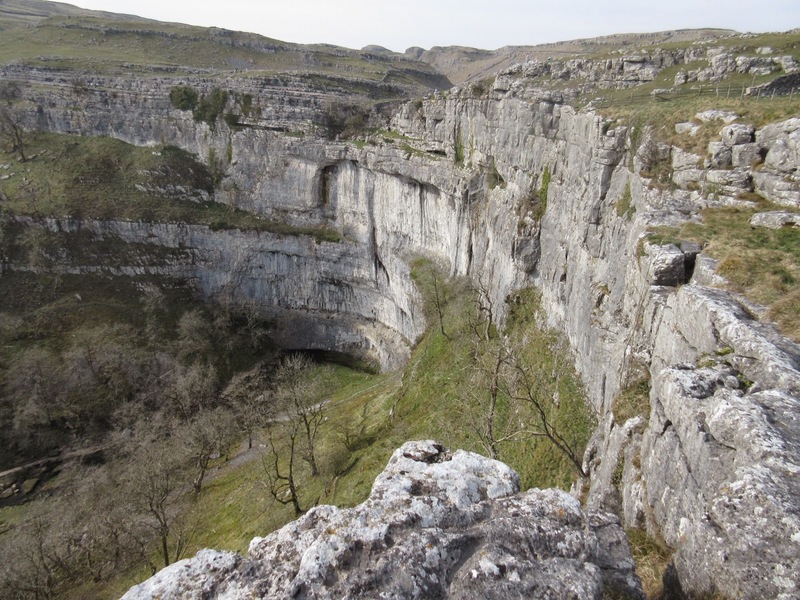 It is possible to follow the fault line itself towards Malham, where the actual boundary can be seen separating uplifted Great Scar Limestones with emerald green turf, from the more acidic brownish grasslands above the Bowland Shales and grits. Malham Cove itself is a major feature of the Mid Craven, but the great cliff has retreated about 500 metres (1600 feet) north of the fault line due to erosion, while meltwater at the end of the last glaciation carved out the great gorge of Gordale Scar by exploiting weaknesses in the uplifted rock.